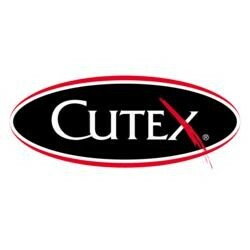 Cutex Cuticle Care Nail Treatment is formulated with Cottonseed oil, Monoi Milk, Tea Tree Oil and Vitamin E to penetrate the skin quickly and moisturize without an oily feel. 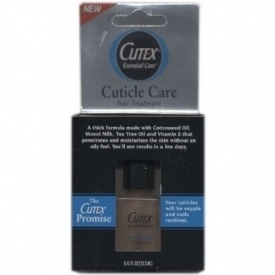 It is also thicker than cuticle oils, so a precise amount can be applied to the nail near the cuticles. Apply as often as you feel to the cuticles and massage the product in. Aloe barbadensis leaf extract, caprylic triglyceride, cocos nucifera ( coconut oil), cottonsead oil, fragrance, gardenia tahitensis flower extract, hydrogenated styrere/isoprene copolymer, mica, mineral oil, tea tree oil, acetate, water, Xanthan gum. Hard to say if I would recommend it - it dies a good job but its non eco friendly rating slightly puts me off. I found this smelled good and was a good product for keeping my nails in condition. Sadly when I looked to find the list of ingredients I discovered that the company's environmental policies, practices and performance place it among the worst 50% of companies rated by GoodGuide and furthermore their social policies, practices and performance place it among the worst 50% of companies rated by GoodGuide. This made me a bit unhappy and I think I will probably try and find a more eco and otherwise earth and animal friendly product when I finish mine. 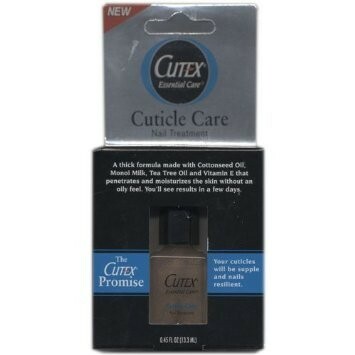 Does a great job at softening and keeping my cuticles in good condition. "Hard to say if I would recommend it - it dies a good job but its non eco friendly rating slightly puts me off. ..."